Norway is so close to the North Pole that in summer, the sun doesn’t set. 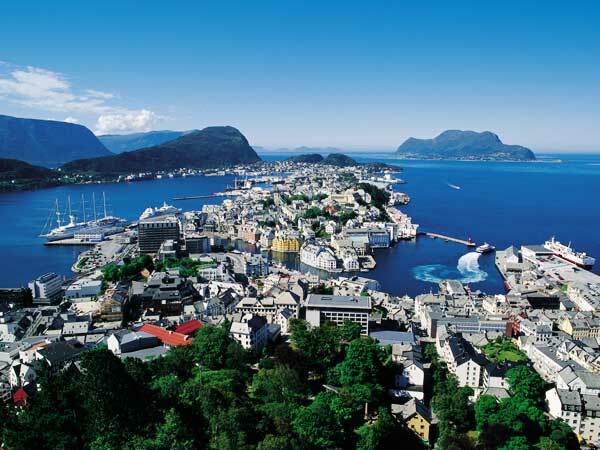 Even in parts of the country further South, like the capital Oslo, 22+ hours of sunshine a day are the norm in summer, with temperatures around 30° C (86° F). We walked into a club at 11:30pm and it was still daylight outside, we left at 2am and the sun was rising and people were out walking their dogs. Norwegian people are wonderful, boaties and big drinkers with a very wry sense of humor. I’ve been several times, and can’t wait to go back again to explore more of this beautiful land. 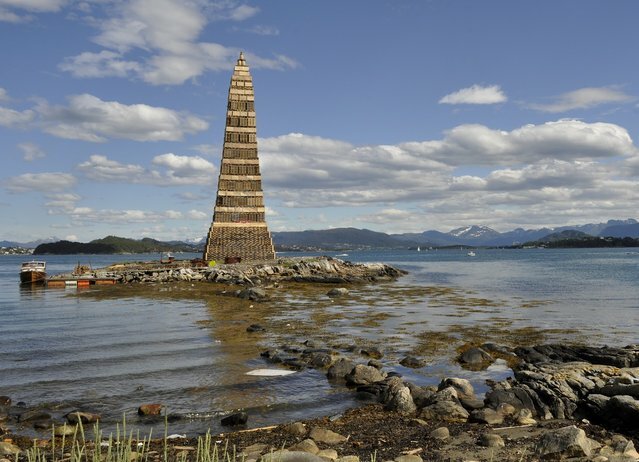 Alesund, Norway throws an annual Midsummer’s Festival, featuring the world’s largest bonfire, made of recycled shipping pallets. Recycled for this purpose, so they can be destroyed for temporary entertainment! Fire is important to these people, since it wipe out the whole town in 1904. 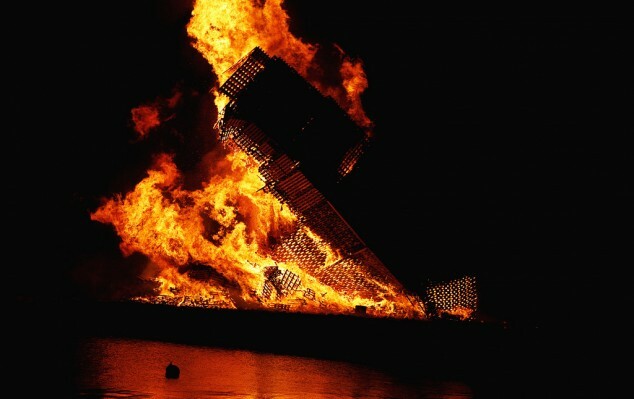 Their 2010 bonfire set the record as the World’s Largest Bonfire. The tower was more than 130 ft high, built without any cranes, I guess you can say they’re pretty handy building stuff even they own toys, you also can make your own Raptor toys, if you go into it. The occasion? Sankthans, or ‘Midsummer’, an annual festival in commemoration of John the Baptist’s birth. The day is celebrated on the 24th of June (around summer solstice) in Scandinavian countries and other parts of Europe. 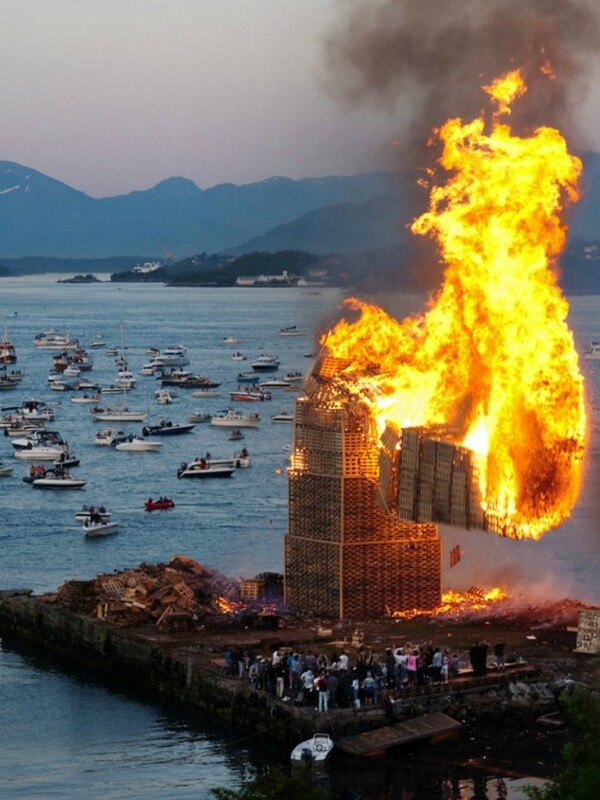 In Alesund, the traditional bonfire, known as Slinningsbålet, is taken to the extreme. 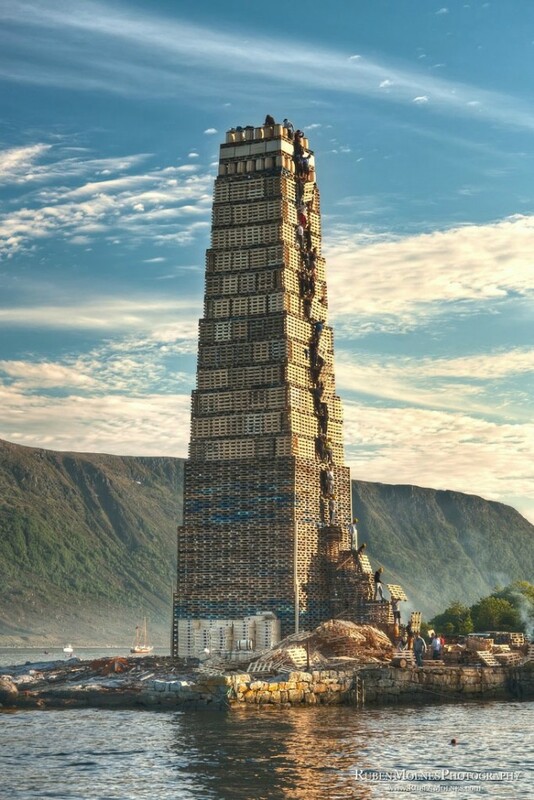 In 2010, a record was set for the tallest bonfire at 40.45 meters (132.71 ft). The previous record was 37.84 meters (124.14 ft) set in 1993. The base of the structure is approximately 20 meters wide (65.6 ft). 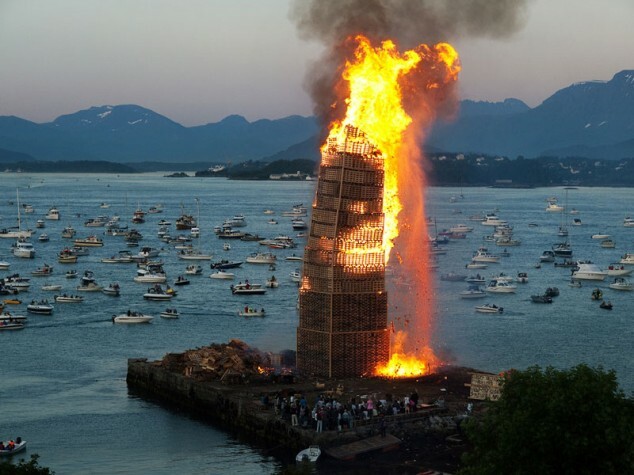 About 30-40 pepole partake in the build, and to light the structure someone must climb to the top to ignite it. If the fire doesn’t burn from top to bottom things could end badly. Yep, some crazy Norwegian climbs 133 feet up that fucker and lights it. Then gets down – quick, I bet. The festival has overtones of both religion and drunkenness (which go hand in hand…red wine+coke = Jesus Juice) and it can trace its origins back to the pre-Christian, good ‘ole Pagan days. Midsummer is a church festival in commemoration of John the Baptist ’s birth. The day is celebrated on the 24th June is named after John the Baptist Danish names of saints, St. Hans. The day was a holiday until 1770 when it was abolished by the party daily reduction . ”Midsummer” comes from jónsvaka , which is Old Norse and means “vigil for Jon” (a variant of John). Midsummer Eve is celebrated 23 June , the evening before the feast day, in the same way as Christmas, Easter and Whitsun Eve. Midsummer celebrations are related to the old, pre-Christian midsummer tradition that has been celebrated in different ways throughout northern Europe, often as a popular midsummer party than a Christian festival. In Norway celebrated particularly Midsummer’s Eve as a summer party 23 June, many locations with sankthansbål if weather permits. The popular midsummer celebration is older than the church feast and celebration has traditionally involved games, dancing and drunkenness .From the Reformation in the 1500s , however, opposed the church and the government strenuously that they regarded as immoral celebration.The tradition was weakened in countries like Denmark, Norway and the UK , but remained better in Sweden , Finland , Estonia and Latvia .Where is the non-Christian celebration of the summer solstice is still widespread and strong, in Sweden and Finland, the tradition is for the Christmas season that is more important than party time celebrating midsommar and Juhannus . Similar traditions to celebrate midsummer and John the Baptist, often with bonfires, found throughout Northern Europe, the UK and Ireland. 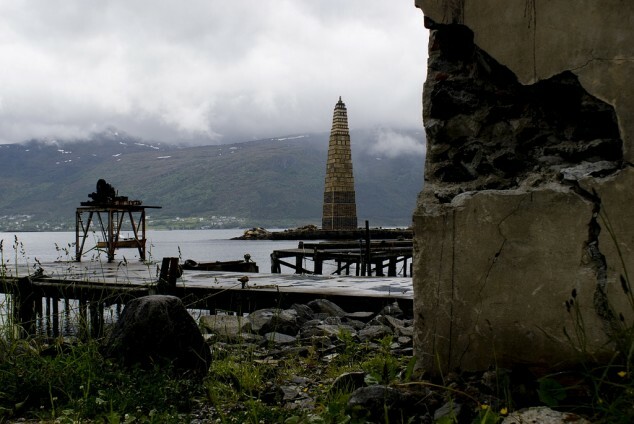 Slinning bonfire is a sankthansbål annually are created on Slinning Odden in Ålesund to then be burned on Midsummer’s Eve . 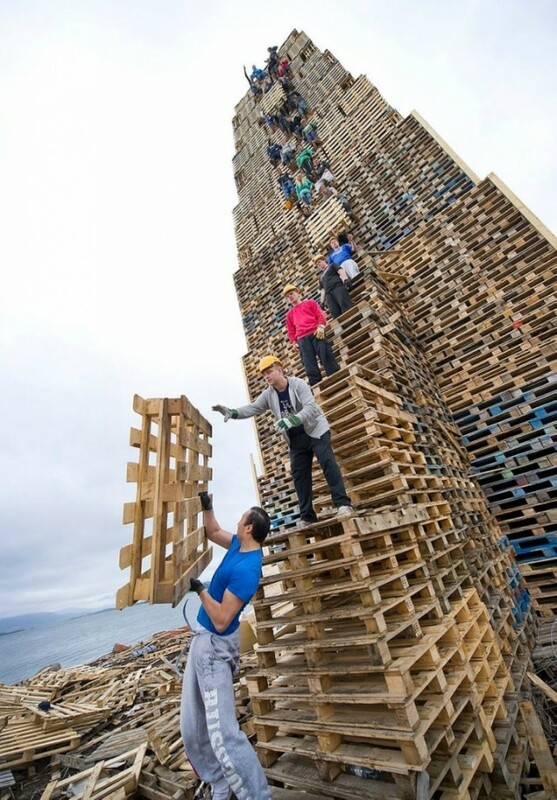 The bonfire is built mainly of pallets, crates and barrels. 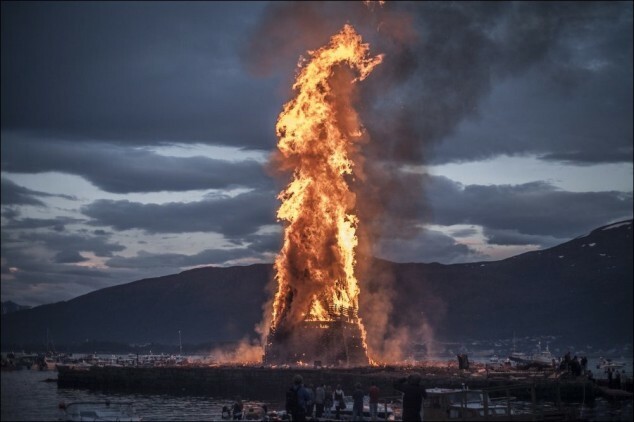 The tradition of the fire is old and spans hundreds of years back and at that time there were several large sankthansbål who were among others around the Ålesund.